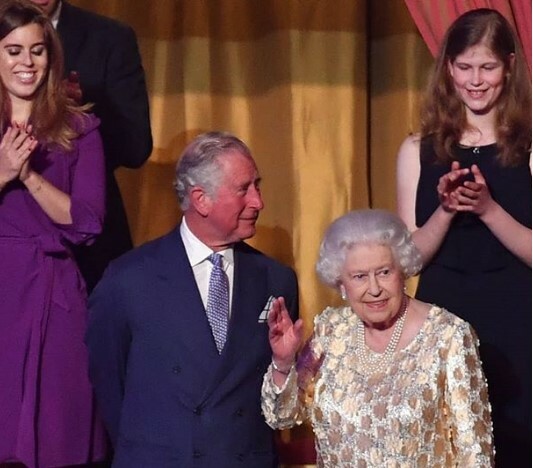 The concert featured some of the biggest names in British music but I'm sure they won't mind anyone noticing that they all seemed slightly overcome to be performing in front of the Queen. Sir Tom Jones, Craig David and Kylie Minogue all waited in the wings while the Windsors took their seats in the royal box. Or royal boxes. There were so many there, they had to take up three parts of the balcony. In the main seats were the Queen's children. Charles came with Camilla, Anne came with Timothy, Edward arrived with Sophie and Andrew was flying solo. Six of HM's grandchildren were there, too and that's where the debuts started. The Earl and Countess of Wessex brought their elder child, Lady Louise Windsor, who turned fourteen just before Christmas and is suddenly very grown up. We're not done with royal box debuts yet. What with two royal weddings coming up we got a pair of fiances making their first appearance at a big royal evening event. Jack Brooksbank walked in with his bride to be, Princess Eugenie, but all eyes were on Meghan Markle who was making her second appearance of the day alongside her intended, Prince Harry. The Gloucesters and the Kents, who still do so many royal engagements on behalf of the Queen, were in the boxes on either side of the main seats. The Duke of Cambridge, second in line to the throne but still noticeable by his absence on the royal diary for large parts of the year, sat next to the grandmother he will one day follow as monarch. Let's do the music bit. Tom, Kylie and Craig were just a few of the stars taking to the stage to get the party started. They were all top notch but had to share the limelight with the unlikely trio of Ed Balls, Frank Skinner and Harry Hill paying tribute to George Formby. Yes, George Formby, he of cleaning windows fame. Mr Ukelele was a favourite of HM and their peformance certainly put a smile on the birthday Queen's face. Then it was the turn of princes. William stayed in the royal box while his brother and father took to the microphone to lead the tributes to the Queen. Prince Harry was speaking in his capacity as President of the Queen's Commonwealth Trust which has just recently been created and which focuses on young people and their leadership skills. He told his granny she was ''hard'' to buy gifts for but that the trust was one way of celebrating her birthday. Then it was the turn of Charles who surprised absolutely no one by calling the Queen ''Your Majesty, Mummy''. He's done that turn so many times that even HM rolled her eyes briefly in a good natured send up. Charles was clearly too proud of his mama and asked everyone to join him in ''three unbelievably rousing cheers'' for her birthday. It's interesting to watch the way the Queen's birthday has become more and more of a major event. We always noticed it but now it's become a kind of landmark in the year as the woman who was never meant to rule notches up yet another record. And it's not just that Elizabeth II keeps on keeping on, she just does it all so well and every year brings yet more successes and reasons to admire her. That's worth three cheers in anyone's book.